From the time product management has been around, there is a notion that to be effective, product managers should behave like CEOs for their product. A belief that the successful product managers have the power to make decisions for their product like CEOs do for a company. Others can provide all the input they want, but the final decision should be left in the hands of the product manager. In my career of 20+ years having worked in many software companies in the Boston area, startups to large companies, this is furthest from the truth – I have never seen a product manager having the final authority to make critical product decisions like CEOs have. The CEO has the final authority for making critical decisions for a company. The notion that product managers lead by “influence” and not “authority” is absolutely true and this by very nature indicates that product managers are not CEOs. No one reports directly to a product manager unlike a CEO. This held true even when I was a product management exec – I could choose to exercise making a final decision with my direct reports, but usually not one that spans across the organization. So if a product manager is not a CEO, are they anything that starts with a “C”? I say Yes – successful product managers are “Chief Information Officers” or “Chief Influential Officers” of their products – the product’s CIOs instead. Like a CEO, a product manager needs to work with every external and internal constituency that touches their product – customers, industry analysts, partners, executives, sales, marketing, legal, customer support, order management, engineering, QA, you name it. From all these interactions, the product manager gathers a 360-degree view of the environment their product needs to be successful in. They become experts in “all information” that is related to their product – information related to competitors, sales, product performance, product issues, customer support issues, the list goes on. Product manager becomes the central point for not only collecting this information but also in ensuring that the right information is communicated to the right people in the organization. It is having the latest and complete product information that gives the influential authority for the product manager to influence their cross functional team and in guiding them to make the right decisions for their products. More trust you build up in the organization as the “go to person” for the product information, more influential you become as a product manager. More time you are spending time outside the building gathering information about the people who will buy your products, more influential you become inside your own organization. One can argue that even CEOs do not make all the decisions but lead their team to make the right decisions. True, but let us not forget that the CEO indeed has the authority to make a “my way or the highway” decision which product managers never do. Hence the big difference in my opinion. So let us not lull ourselves to believe that we are CEOs of our products, but instead call ourselves the CIOs and work hard to become the best product CIOs we could ever be. Do you agree? If not, let me know through comments. If you agree, I would appreciate if you share this with your product management network. You all have likely heard the term FOMO – “Fear of Missing Out” – the fear that makes us buy products/services because everyone else is doing it and for the fear of missing out on something that others are getting out of it. A fear that has been proven to move products – people wanting stuff that is short demand (“ONLY 5 SEATS LEFT”) or has a sense of urgency (“20% off only TODAY”) or one driven by social proof (“all my competitors are using the software, so I should use it too”). The fear that drives users from mere window shoppers to instant buyers. In the technology adoption cycle made famous by Gordon Moore in the book “Crossing the Chasm“, this fear moves the late majority to buy your product or service. But this is a fear that is experienced on the buying cycle – one experienced by your customers that makes them want to buy your product/service. However, a more important fear that needs to exist in every company is the “Fear of Missing Touch” (Thank you Steli Efti for introducing me to this term at the Growth Marketing Conference in NYC yesterday). Without this fear within the walls of your offices, you have a very low probability of developing any product/service that will generate FOMO within your target market. So what exactly is the Fear of Missing Touch? Fear of Missing Touch is the fear of not being in close touch with your target users that you don’t have a very good understanding of your target user’s pain points, needs and challenges. It is the fear that you are not leaving your office (where btw, none of your target users live) enough number of times to “spend time in the wild with the natives”. It does not matter how many internal opinions are held within your office about what users want, unless you as a product manager is spending time outside the building listening to users and understanding what problems keep them awake so much, that they are willing to pay for a solution, you do not stand creating a product/service that will create FOMO. Don’t fall into the trap of not doing this because you hear stories of “Apple does not do this” or “Facebook did not do this” because they are mere exceptions led by exceptional one-in-million-leaders than the norm. Your chances of being an Apple or Facebook in winning is the same as winning the lottery. The business world is littered with more corpses of failed companies than successes. Being in CONSTANT touch with your target customers does not guarantee product success, but not doing it guarantees failure. Our founders have talked with target users before they started the company. I believe the main reason for not getting started is inertia. There is a feeling that you have to visit a lot of customers before it would be useful – not true. So here are three action items that you could use to get started, overcoming that inertia. Set a goal of visiting just “ONE” customer a month (3/quarter). Once you get used to it and start seeing the benefits, up that to 5 customers a quarter. Visit that customer and send a report of what you learned to everyone. Or present at the company meeting to create awareness that you are visiting real people who will pay real money to buy your product/service. Invite others to join you on your next visit. Trust me, you will be amazed at what you learn, how eye opening it would be for you if you do it right. If you want to know, how to do it right, read my previous post on “Customer visits – dos and don’ts“. A word of caution – visiting target customers needs to be a continuous endeavor because customer needs change over time. There is never a state where you will ever understand everything you need to about your target customers. Do you agree? If yes, please share this post with others in your network. Thank you. Equity offered is directly proportional to your title: Startups have what is known as a capitalization or a cap table. In its most simplified form, you can think of it as a two-column table – first column lists the titles in each row and the second column lists the % of ownership each title is given. Founders get the most equity, a hired CEO gets the next big chunk, VPs get more than Directors, Directors more than Managers and then at the bottom are those who are individual contributors. So your title determines what you get. Of course, there may be exceptions especially for the first few employees, but the cap tables are a general rule of thumb when it comes to equity grants. Note that I specifically used % of ownership as opposed to number of shares (this is another pitfall you should avoid). The number of shares mean nothing other than possibly stoking your ego. Being granted 50,000 shares may make you feel good, but if the outstanding shares are 100 million, you have just 0.05% of the company. This means if the company gets sold for $100M dollars 5 years after you join, the maximum you will ever get in exchange for your 5-year sweat equity is $50,000 (and even this is not a given and it depends on the terms at which money was raised from investors). Instead if you had 1,000 shares in a company that has 100,000 shares, you own 1% of the company. If it now gets sold for the same $100M, you could get a sweet $1M. Current title typically determines where you go next: Very few startups succeed, actually only a minuscule of them. You may have a fancy title of “The Cool dude” in the company that says titles do not matter and one that touts great culture. Even if you were responsible for all of product management, it could hurt you in the future. Future employers will not know what “The Cool Dude did” or may not even believe what you did. I would any day choose a title of Director of Product Management or VP of Product because it sets you up for your next stepping stone. Note, the founders of a company will make sure that they have the title of “Co-founder” in their titles for a good reason – it demonstrates their entrepreneurship and risk taking abilities. So I don’t buy when I hear startups say “we are not big on titles here”. Don’t get me wrong, I have always done what is needed to get the job done independent of what my title states, but that does not mean that the title is not important. HR cares about titles: If your startup gets acquired and if the acquirer decides to eliminate positions, severance payouts are usually based on your position in the hierarchy. I have seen execs walk away with a much bigger pot of gold than individual contributors have. Even if you are not let go, your compensation structure (bonus, stock options etc.) in the new bigger company will be dependent on the title you held in the smaller acquired company. Titles matter when speaking to customers: “The Cool dude” on your business card is not going to help you much if you are trying to close a deal for your sales team or if you are trying to meet with an executive of prospective clients. Titles like Director of Product or VP of Product Management likely will. Customers want to spend time with whom they perceive has decision making authority and not with “The cool dude”. Just my opinion. What’s your take? Depth of communication – given their different roles, I find out upfront how much detail they want to know on the progress I was making or problems I am encountering. Do they just want to know “release is on track” or do they want to know the the status of each of the features in the release including which ones have been completed, in dev or in testing? Establishing this upfront helps alignment of expectations and prevents surprises later. Channel of communication – now that the content depth has been established, I then establish how my manager wants this to be communicated. Do they want it by email? Skype? Some managers would like to get a status update the night before my 1:1 and others have requested an update during the 1:1. “House is on fire” issues – these are serious issues that need to be escalated as soon as possible, issues that need to be handled above my pay grade. These are rare but when they happen, I will chase down my manager to communicate the issue face to face or give them a call. Important but not urgent – If it cannot wait till my next 1:1, I send it to them via their preferred communication channel (typically email) so that they are in the know and can provide me a decision or guidance I am looking for. Normal, “run the business” issues – I keep a running list of things I want to talk to my manager about during the next 1:1. If I feel that some of these issues require some thinking from their end, then I send it to them before hand and label them as “talking points” for my 1:1. I have had great success using the above techniques, so hopefully you will find it helpful as well. Thoughts? Other techniques you have used that work well? Communicate immediately acknowledging there is a problem without revealing the seriousness of the problem and details of how you are going to fix it. When substantial time is needed to gather data to understand the impact and quantify the size of the problem, I always prefer the latter. In an emergency, it is important to acknowledge that you are aware of the problem and to communicate the message “we are on top of it”. This way everyone (especially your senior management) know about the problem and can rest assured that folks are actively looking into it. Then, once you have gathered more information follow up with the details, options to fix the problem and the recommended solution. Instead, if you wait until you have all the information and good amount of time goes by, someone is going to find out, things get miscommunicated and you could spend more time trying to set things right. Relate this to when tragedies strike – there is always a “first responder” team that appears on the scene immediately. Their job is to arrive first at the scene and take charge of the scene and start the data gathering process. As a product manager, you should be your team’s leader and part of the first responder team. On-time communication with the whole team is one way to gain respect and make you the go-to-person on your team. 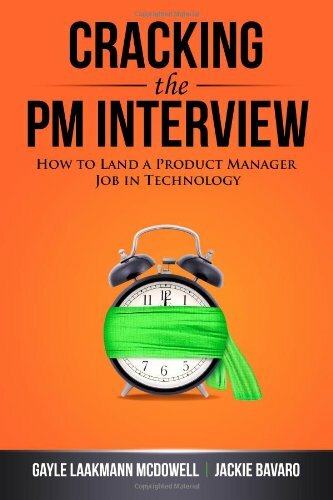 If you are a product manager thinking about your next career move or someone looking to move into product management, this is THE book you should read and have as your reference. I have been doing product management for many years and I found the book so resourceful. Gayle Laakmann McDowell and Jackie Bavaro have done a great job covering everything from the definition of a product manager role (remember that different companies have different definitions of what we do), how to transition from a non-PM role to a PM role, how to write a cover letter and resume that gets looked at to potential questions (behavioral, case studies, analytical problem solving) that you could be asked in a PM interview. They have interviewed product managers in companies such as Google, Twitter, Airbnb and Microsoft asking them about their day-day to activities and also senior Product Leaders as to how they have managed their careers. It is written so well that it is a very easy read. The chapter I loved the most in the book was the one on “Estimation questions” where different examples such as “how many tennis balls can fit into an apartment” are worked out. The only chapter I have not read in the book is the one on “Coding questions”. This is only because I believe that Product Manager’s focus should be on the “Which” and “What” and not the “How”. It is our job to discover the customer problems, figure out “which” market problems are worth solving and “what” the solutions should look like from a User experience perspective. It is engineering’s job to figure out “how” they are going to develop the identified solution. But the chapter does not take anything away from the book. I am confident that this book can end up to one of the best investments you could make if you are thinking about switching or finding a PM job. I strongly recommend it. This is the most frequent question I get from readers of this blog. Folks who currently are developers, QA engineers, sales professionals, customer support specialists have all asked me this question. I have written how you could start making the move to product management. But here is a course that is now available from udemy. It is a 33-Video Lecture Course called, “Skillsets to Shift Your Career to Product Management,” is intended for beginning technology entrepreneurs, and for technology professionals with no background in marketing and product management. The course is narrated by Raj Karamchedu, a Silicon Valley technology business executive with over 19 years of experience in the markets of wireless, mobile, semiconductors, software and hardware. He is currently a co-founder of a boootstrapped Silicon Valley-based startup. Previously he was at Legend Silicon (an Intel Capital-funded fabless startup) with two hats, Vice president of Product Management and Chief Operating Officer. To get more information on the course and to get the 77% discount (offered to readers of this blog), click on the link below.